David Hockney’s landscape paintings are large and cover vast terrestrial expanses. After visiting his exhibition, I challenged myself to find an artistic expression for Landmass. I toured the museum for a bit but finally got the idea from the view of the bay area at the de Young Museum tower. 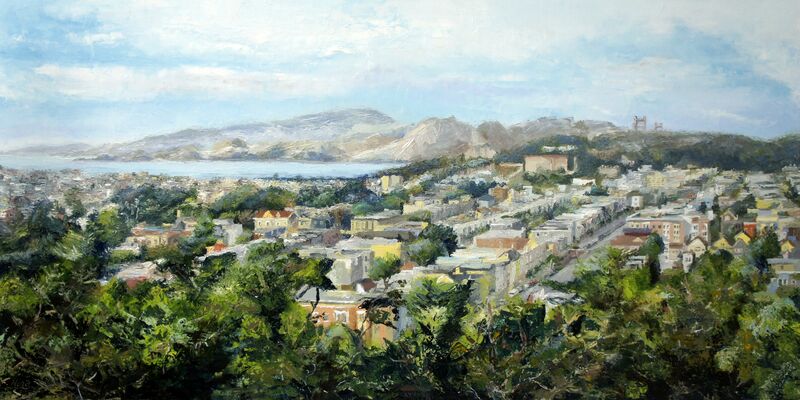 My piece titled ‘Bay View’, an oil on canvas painting, is my resolution. I made it more expressive by building its texture with thick paint application and the use of a palette knife. It makes a connection between the art and its exhibition space, making the de Young Museum not just a place for art but also art itself that extends to the views it captures.